With an ear for tender pop hooks and a back woods, homespun country flavor, the blue collar honesty of Brady Harris shines bright as he takes you down the road most traveled of broken hearts, sorrow, and nights of alcohol blurry-ness. Giving you a tour of his world - a universal world that speaks to you through each and every song - Brady Harris is able to communicate directly to your heart as he makes you feel every word, note, and sound he throws at you. "Sunday Shining" rollicks around with a jolting mixture of strong-willed country and boisterous, whiskey-soaked rock 'n' roll. But the attention to detail never fails, as ample pop and the warm-hearted honesty and struggling, yet still standing integrity wins out and reels you in for some excitement. The hook-laden, steadily pulsating ring of "Koreatown" will have you up and moving. Brady's voice is husky and strong; knowledgeable enough to dispense a story without fear of losing an audience, because when the words are unleashed, you can't help but follow them with great interest. "Falling Down" delivers a relaxed, sunny day country beat with enough rock 'n' roll to keep things moving swiftly and everyone on their toes. "Save Yer Love For Me" goes straight to the heart of Texas (Brady's old residence, as he know resides in L.A.) and comes out with some tingling country. Then there is "Drunk With You," a twisting, whiskey-soaked, melancholy tale of loving and drinking, a combination that often leads to an epiphany or disaster. 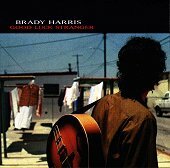 With a strong grasp of country roots, a knack for coupling pop hooks with driven rock beats, and vocals that transcend the lyrics beyond just works on a sheet of paper, Brady Harris strikes a chord and keeps you enjoying his music throughout the entire album. Rich country, plentiful rock 'n' roll, and a warmth that always comes first, Good Luck Stranger is an album you can put on and get drunk too; one you can play while you're driving down the highway; or just a good time record you can put on whenever you feel like some good music. I'll give it an A-.